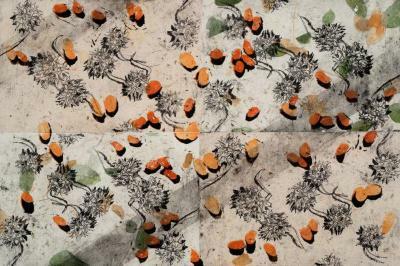 Cynthia Back, Las 99 Semillas: Del Norte y Del Sur, Etching, linocut, aquatint, chine colle, 18 in X 22.25 in, 2012. 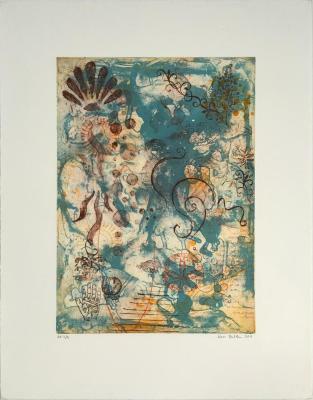 Ken Buhler, Notes From the Edge of the World # 7 , Etching, 23 in X 18 in, 2011. 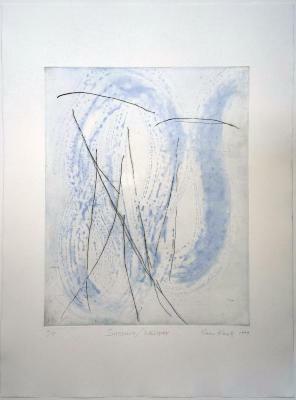 Beth Caspar, Dancing with D’Arcy Thompson (series of 4), Linocut, ed. 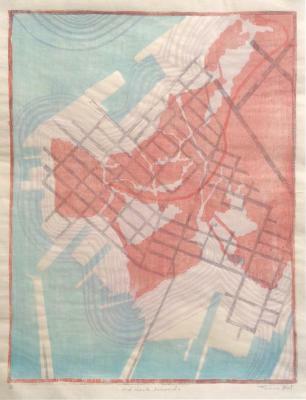 4/10, 24 in X 26.25 in, 2000. 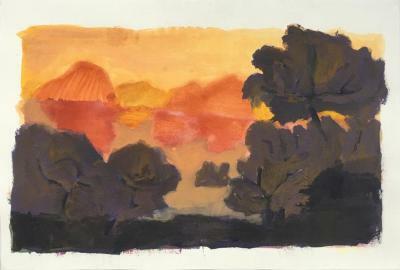 Gail Flanery, Junction, Monotype and chine colle, 11 in X 14.75 in, 2014. 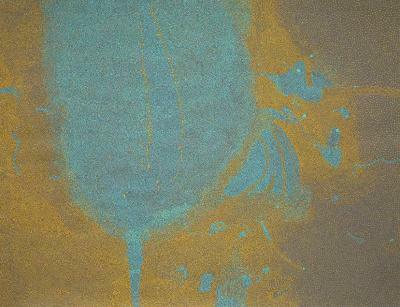 Felipe Goes, Drawing #255 (A14N333), Acrylic on paper, 11.75 in X 18 in, 2014. 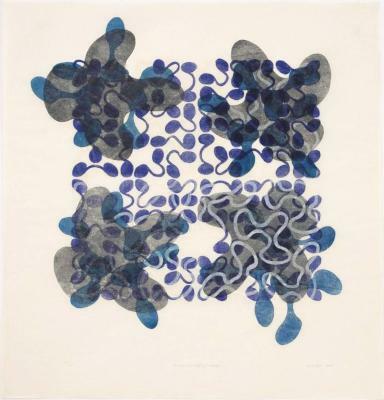 Keiko Hara, Verse - Sukumu 1, Monoprint, 22 in X 15 in, 2011. 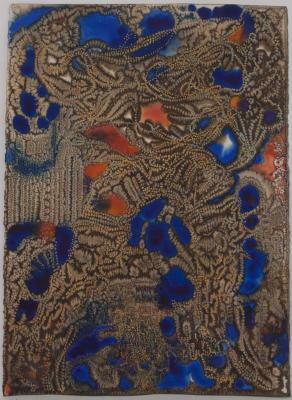 Carter Hodgkin, After Effect 2, Watercolor and gouache on paper, 24 in X 18 in, 2002. 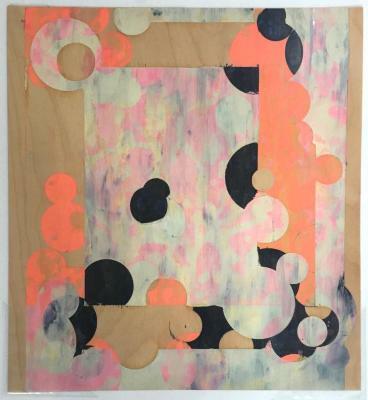 Meredith Hoffheins, Crevasse in Springtime, Acrylic on Stonehenge paper, 10.25 in X 15 in, 2015. 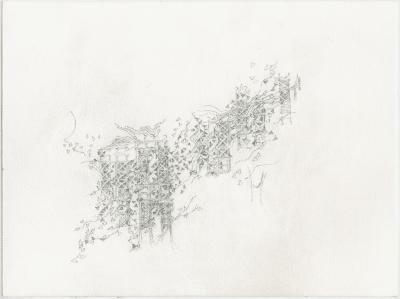 Katherine Jackson, Bridge I, Graphite on paper , 9 in X 12 in, 2015. 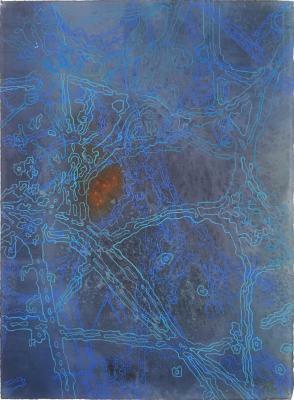 Kumi Korf, Sussuro Whisper, line etching and spit-bite aquatint, AP , 19.75 in X 15.75 in, 1999. 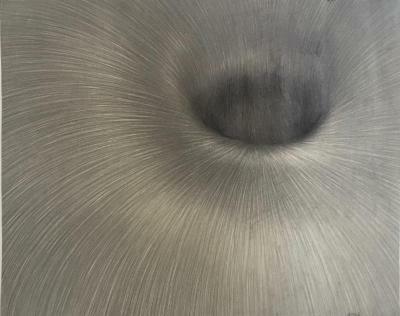 Jiří Kornatovský, Meditation, Graphite on paper, 15.25 in X 19.5 in, circa 1992. 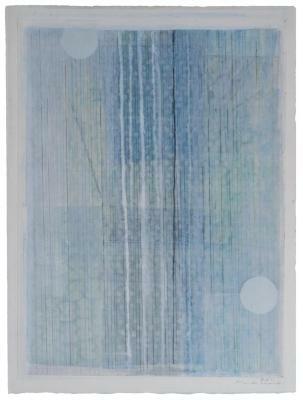 Karen Helga Maurstig, Lines in Ice, Variation I, Japanese Woodblock, 20 in X 14 in, 2010. 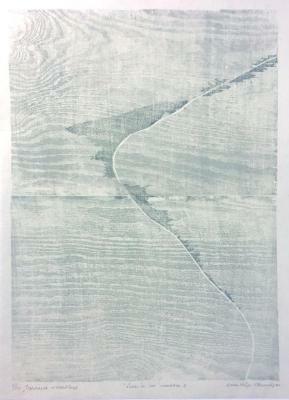 Karen Helga Maurstig, Winter Sign III, Mokuhanga Japanese Woodcut, 37.25 in X 25 in, 2012. 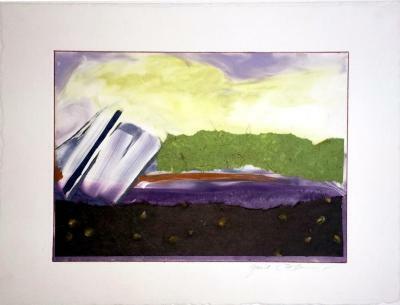 Jim Napierala, Bandaleon, mixed media on veneer, 13 in X 12 in, 2007. 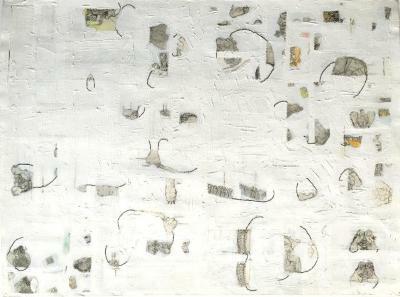 Susan Newmark, Body Part Series: Central Supports/Spine, Collage and thread on paper, 22 in X 30 in, 2005. 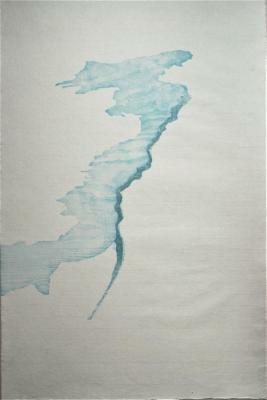 Paula Overbay, Lake, Acrylic on paper, 18 in X 24 in, 2012. 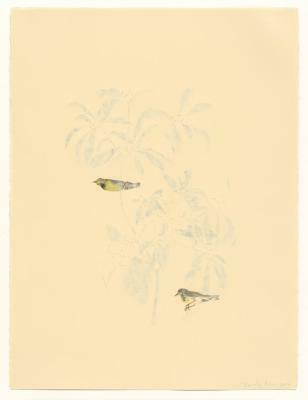 Beverly Ress, Bachman’s Warbler (After Audubon), Colored Pencil and cuts on paper , 30 in X 22.5 in, 2012. 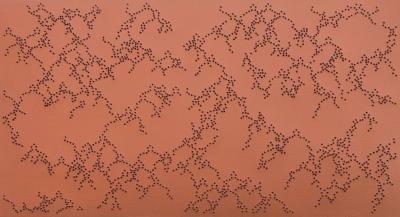 Taney Roniger, Bifurcations Series (Copper #1), Pin pricks and metallic paint on paper , 15 in X 27.5 in, 2014. 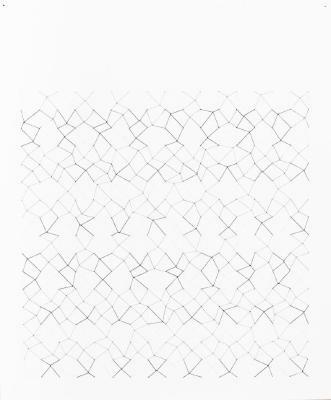 Donna Ruff, Osiris, Graphite and burns on paper, 30 in X 22 in, 2007. 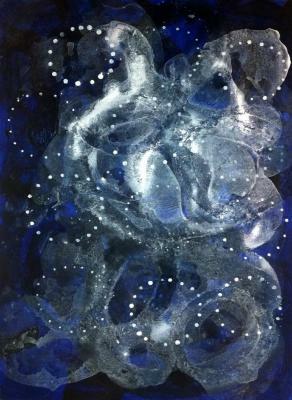 Andra Samelson, Cosmologies 1, acrylic on paper, 30 in X 22 in, 2012. 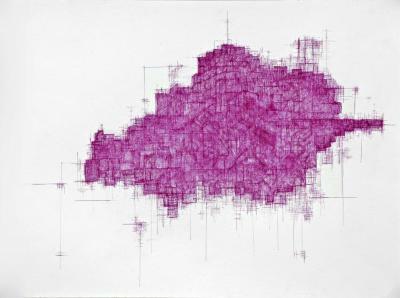 Claudia Sbrissa, Castelfranco, Ink on paper, 11.75 in X 15.75 in, 2009. 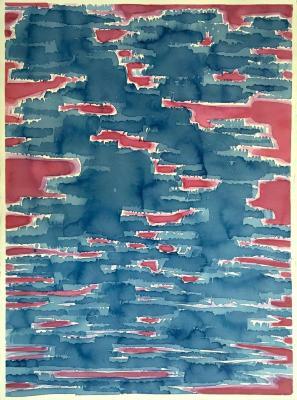 Robert Schwinger, Rain Song, watercolor on paper , 22 in X 30 in, 1997. 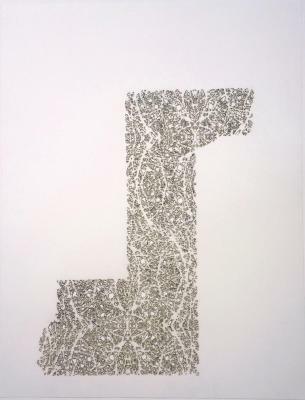 Audrey Stone, #34, Thread, ink, and pencil , 17 in X 14 in, 2010. 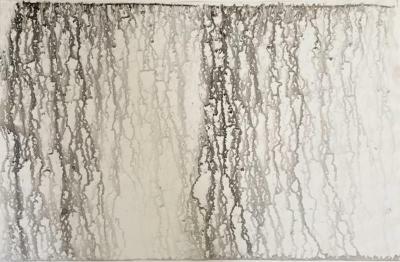 Martin Zet, Untitled (Rain), Ink and rainwater on paper, 26 in X 40 in, 1999.